The fact is that there is crime surrounding both handguns and high powered guns and there does need to be something done to reduce the number of casualties that occur from gun-related crime each year. Now, while statistically more people in the US are killed every year by hand-guns this still does not justify the need to own much more high powered weapons capable of killing numerous amounts of people in seconds. High powered weapons are not needed to for self-defense where a simple hand-gun will suffice. Further, nor will either hand-guns or high powered guns be enough to do anything in the extremely improbable event of Government Tyranny. So, based on this high powered guns are not needed and can be rightly so, extinguished. So, this is one of the first steps to reducing casualties and/or deaths that occur as a result of high powered weapons; to make them inaccessible. Calibrate stricter laws so that the guns do not fall into the hands of bad or irresponsible people. You would do this by ensuring that gun owners and potential gun owners have regular background checks as well as psychological checks. These checks would take place every five years minimum. Ensure that everyone that wants to own a gun has training in how to actually use it, and take a gun safety course. Put in place a stricter selection process for all Police Officers. As we have seen in past times there are Police Officers that are trigger-happy and tend to rely more on their guns than their actual brains. These courses of action would entail psychological tests, including intelligence testing. Fine-tune laws/policies that would more robustly tackle the issues of drugs and gangs as a lot of gun crime also revolves around these factors. Now, what are your views? Do you agree with all of these proposols? 4. We’ve already got a lot of those in place. Could you elaborate? The fact is that there is crime surrounding both handguns and high powered guns and there does need to be something done to reduce the number of casualties that occur from gun-related crime each year. Indeed, it is a fact that there is crime surrounding both handguns and high-powered guns. But that something needs to be done to reduce the number of casualties is not a fact, but a subjective opinion. On the scale of all the problems that this country faces, gun crime is arguably pretty low on the list, to the point where the average American does not have to even think about the existence of such crime, as it affects a negligible minority of people. I also do not understand why all solution ideas on the gun crime always involve the governmental action. It is always about making everything more strict. Is it not counter-productive, to tackle the issue of misuse of force with misuse of force? There are countries out there that have gun laws that are just as lax, or even more so, than in the US - and they barely have any gun crime at all (take a look at Israel and Switzerland, for instance). The problem is not in the laws - people who shoot others with guns could not care less about laws. The problem is in the culture, and cultures cannot be forced to change without a very strict authoritarian system in place, which I do not think Americans want to live in. All-in-all, gun crime seems to be just as much of a distraction subject to me as, say, abortions. Both problems are non-existent as far as the impact on the life of the average resident goes, and there is a vast array of problems that are much more urgent than this - but both are constantly used as a political weapon by various parties and individuals. Let people buy whatever they want. Penalise the violent act, not the purchase of an instrument that *might* lead to a violent act. Make police officer training into a decent all-rounded education. The current system with a few months of training before the deployment makes little sense. Even us, physicists and mathematicians, spend roughly a decade studying before we are considered prepared for our work - and our work hardly toys with people's lives nearly as easily. Police officers, in my opinion, should undertake, at the very least, 4 years of Bachelor's-level education. And those who are authorised to use lethal force should also expected to complete the amount of studies comparable to what PhDs in other fields do. That is it. Expect high standards from the governmental representatives, but let private individuals set their own standards. The government already barely allows us to do anything in this country without some sort of a permit - perhaps it is time to rethink the approach and to make this country closer to what it was supposed to become back when the Founding Fathers were around. No, nothing needs to be done to reduce the number of casualties that occur from gun-related crime each year. 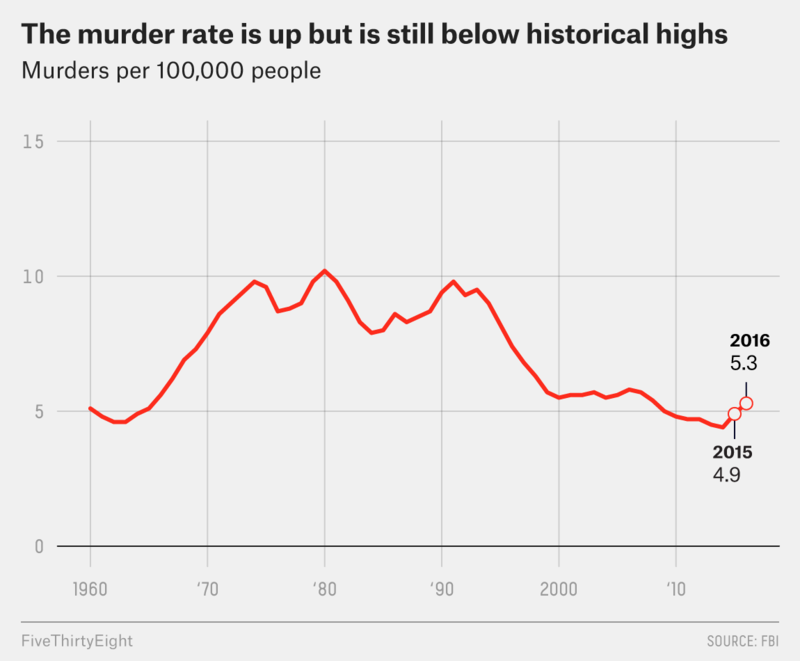 The number of casualties that occur from gun-related crime has been dropping virtually every year since the mid 90s regardless of whether or not anything had been done. 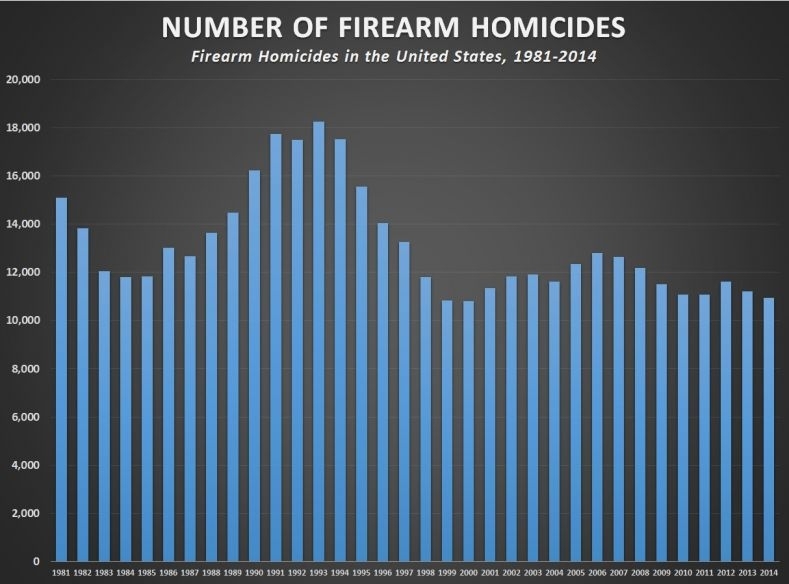 Our firearm homicide rate is roughly half what it was 25 years ago, or approximately what it was in the early 1960s, and the trend continues to decline. Why would we want to mess with what's working? Guns have killed plenty of people, kids, teenages, and adults alike. "A ballistics expert (also often referred to as a forensic ballistics expert or afirearms examiner) is a forensic specialist who is responsible for collecting and analyzing ballistics-relatedevidence, which includes firearms and ammunition." And the above individuals, are utilized to help link, the bullets from the victims, to the very guns that the mass shooters, criminals, or offenders used to kill their victims with. If the mass shooters didn't use their GUNS to kill, all of those innocent people with, then we wouldn't be having this conversation over people having used their GUNS to kill people with now, would we? Who is "targeting" law abiding citizens? "Proposals on how to tackle the issue of gun related crime"
Some of the pro gun crowd, may look at this question and balk at it? A probable problem with some of the guns in the U.S.? 1) There are 393 million various guns in the U.S.
2) There are roughly 323-325 million U.S. citizens. Across the country there are roughly 900,000 Police Officers who while performing their duties, get to deal with the criminals, and offenders, who are illegally carrying guns, and have used their guns to commit non race on race, and race on race, crimes with? So there are more guns in the U.S., than there are U.S. citizens. There are so many guns, that even when criminals, and offenders aren't supposed to have a gun, these individuals can get a gun by someone selling them on the street. So the 2nd Amendment, is appreciated by some, and abused by others. Guns are the other doubled edged sword. Could it be said, in a sense, that the 2nd Amendment is why there are 393 million guns in the U.S.? And some of the citizens used the 2nd Amendment, to create a gun violence brutality problem for the rest of the citizens in the country to have to put up with, and live with? The domestic abuse, and violence shooters? So, there is a mass illegal gun problem, and a gun violence brutality problem in the U.S? It sure does seem that way? And the best way to reduce the gun related crimes? Refrain from committing, any gun related crimes altogether. But what happens, is that some fail to respect themselves, and respect the humanity around them with the same respect, and then the thousands of gun related, gun violence crimes get committed each year. You can go to FBI.org, and see the statistics for yourself. Or go to YouTube, look up gun violence, and see what videos, come up? how many guns are owned by private citizens in the U.S.? How many are sold each year? now how many gun murders are caused by people each year? What % is that, pretty low right. Yet as gun sales increase the gun murders decrease, how do you explain that? (OP) Governmental "psychological checks." think about that for a moment, did something finally click as to why this is beyond absurd? "how many guns are owned by private citizens in the U.S.?" "Americans made up 4 percent of the world's population but owned about 46 percent of the entire global stock of 857 million civilian firearms." U.S civilians own 393 million guns. That is 3 times as many guns as the armed forces of the Russian Federation (30.3 million), China (27.5 million), North Korea (8.4 million), Ukraine (6.6 million), United States (4.5 million), India (3.9 million), Vietnam (3.8 million), Iran (3.3 million), South Korea (2.7 million), Pakistan (2.3 million), and all the other countries (39.7 million) combined. American civilians own more guns "than those held by civilians in the other top 25 countries combined." "American civilians own nearly 100 times as many firearms as the U.S. military and nearly 400 times as many as law enforcement." Americans bought more than 2 million guns in May 2018, alone. That is more than twice as many guns, as possessed by every law enforcement agency in the United States put together. In April and May 2018, U.S. civilians bought 4.7 million guns, which is more than all the firearms stockpiled by the United States military. In 2017, Americans bought 25.2 million guns, which is 2.5 million more guns than possessed by every law enforcement agency in the world put together.Between 2012 and 2017, U.S. civilians bought 135 million guns, 2 million more guns than the combined stockpile of all the world's armed forces. " "Association with rates of violence"
"Some studies suggest that higher rates of gun ownership are associated with higher homicide rates, although Gary Kleck argues that the highest-quality studies show that gun ownership does not increase homicide rates. Higher rates of gun ownership are also associated with higher suicide rates and higher accidental gun death rates. The availability of illegal guns, but not that of legal guns, is associated with higher rates of violent crime. Studies have shown that 36.3% of people had access to a gun and 5% carried the gun with them. However 7.3% stored their guns in an unsafe place. Certain people have blamed individuals with mental disorders for being dangerous and violent with the use of guns. Nonetheless, other studies have been conducted and show that 34.1% have access to guns. 4.8% carry a gun with them and 6.2% store the gun in an unsafe manner. The statistics show that gun ownership is significantly high in both sets of individuals, however, none of the figures show people with a mental illness are as dangerous with guns than people with perfect mental health. " The above is both educational, and enlightening. "now how many gun murders are caused by people each year?" "Gun violence in the United States"
Gun violence in the United States results in tens of thousands of deaths and injuries annually. In 2013, there were 73,505 nonfatal firearm injuries (23.2 injuries per 100,000 persons), and 33,636 deaths due to "injury by firearms" (10.6 deaths per 100,000 persons). These deaths included 21,175 suicides,11,208 homicides, 505 deaths due to accidental or negligent discharge of a firearm, and 281 deaths due to firearms use with "undetermined intent". The ownership and control of guns are among the most widely debated issues in the country. "In 2012, there were 8,855 total firearm-related homicides in the United States, with 6,371 of those attributed to handguns. In 2012, 64% of all gun-related deaths in the U.S. were suicides. In 2010, there were 19,392 firearm-related suicides, and 11,078 firearm-related homicides in the U.S. In 2010, 358 murders were reported involving a riflewhile 6,009 were reported involving a handgun; another 1,939 were reported with an unspecified type of firearm. " "Firearms were used to kill 13,286 people in the U.S. in 2015, excluding suicide. Approximately 1.4 million people have died from firearms in the U.S. between 1968 and 2011. This number includes all deaths resulting from a firearm, including suicides, homicides, and accidents. " "Compared to 22 other high-income nations, the U.S. gun-related murder rate is 25 times higher.Although it has half the population of the other 22 nations combined, the U.S. had 82 percent of all gun deaths, 90 percent of all women killed with guns, 91 percent of children under 14 and 92 percent of young people between ages 15 and 24 killed with guns. Gun violence against other persons is most common in poor urban areas and frequently associated with gang violence, often involving male juveniles or young adult males. Although mass shootingsare covered extensively in the media, mass shootings in the United States account for only a small fraction of gun-related deaths. Legislation at the federal, state, and local levels has attempted to address gun violence through a variety of methods, including restricting firearms purchases by youths and other "at-risk" populations, setting waiting periods for firearm purchases, establishing gun buyback programs, law enforcement and policing strategies, stiff sentencing of gun law violators, education programs for parents and children, and community-outreach programs. Despite widespread concern about the impacts of gun violence on public health, Congress has prohibited the Centers for Disease Control (CDC) from conducting research that advocates in favor of gun control. The CDC has interpreted this ban to extend to all research on gun violence prevention, and so has not funded any research on this subject since 1996." More educational, and enlightening information. nor will either hand-guns or high powered guns be enough to do anything in the extremely improbable event of Government Tyranny. Are you sure this is whole truth? 1. The Precedent set in motion by civil litigation places a burden on a distribution of ballistic shield along with the training on how to use them publicly. 2. The principle of legislating law is being used to discriminate by not creating a united state between those who have gun and may apply lethal force with those people who do not have gun and are just unable to anticipate using deadly force to protect themselves or others. 3. In basic principle a law of any kind cannot stop the number of crimes taking place, committed each year. It has impact on the prosecution of additional crime which can take place. As the accused must stand trial or confess for the crime to be recognized. The idea here may simply be to add quantity of crime in writing so a pressure to make deals on other crimes becomes higher. This however simply is shaving numbers and not crime at all. 4. The general idea of basic principle is to make a court proceeding more efficient so a greater number of people can be helped by impartial separation. This includes underlining perpetual criminal as they become more likely to meet an end by lethal force in the general public. In a show of hands. How many people here who own a gun would much rather have a powerful laser? "How dangerous people get their guns in America"
"The fact is that, even leaving aside the assault in Las Vegas and terrorist attacks like the one in San Bernardino, California, in 2015, gun violence is becoming almost routine in many American neighborhoods. The U.S. homicide rate increased more than 20 percent from 2014 to 2016, while last year's 3.4 percent rise in the violent crime rate was the largest single-year gain in 25 years." "The guns carried and misused by youths, gang members and active criminals are more likely than not obtained by transactions that violate federal or state law. And, as I've learned from my decades of researching the topic, it is rare for the people who provide these guns to the eventual shooters to face any legal consequences." "How can this illicit market be policed more effectively?" The same is not true for criminals, however, most of whom obtain their guns illegally." "A transaction can be illegal for several reasons, but of particular interest are transactions that involve disqualified individuals – those banned from purchase or possession due to criminal record, age, adjudicated mental illness, illegal alien status or some other reason. Convicted felons, teenagers and other people who are legally barred from possession would ordinarily be blocked from purchasing a gun from a gun store because they would fail the background check or lack the permit or license required by some states. Similarly, an ongoing study of how Chicago gang members get their guns has found that only a trivial percentage obtainedthem by direct purchase from a store. To the extent that gun dealers are implicated in supplying dangerous people, it is more so by accommodating straw purchasers and traffickers than in selling directly to customers they know to be disqualified"
While criminals typically do not buy their guns at a store, all but a tiny fraction of those in circulation in the United States are first sold at retail by a gun dealer – including the guns that eventually end upin the hands of criminals. If a gun ends up in criminal use, it is usually after several more transactions. The average age of guns taken from Chicago gangs is over 11 years." "The gun at that point has been diverted from legal commerce. In this respect, the supply chain for guns is similar to that for other products that have a large legal market but are subject to diversion." "In the case of guns, diversion from licit possession and exchange can occur in a variety of ways: theft, purchase at a gun show by an interstate trafficker, private sales where no questions are asked, straw purchases by girlfriends and so forth. There have been few attempts to estimate the scope or scale of the underground market, in part because it is not at all clear what types of transactions should be included. But for the sake of having some order-of-magnitude estimate, suppose we just focus on the number of transactions each year that supply the guns actually used in robbery or assault." "There are about 500,000 violent crimes committed with a gun each year. If the average number of times that an offender commits a robbery or assault with a particular gun is twice, then (assuming patterns of criminal gun use remain constant) the total number of transactions of concern is 250,000 per year." "Actually, no one knows the average number of times a specific gun is used by an offender who uses it at least once. If it is more than twice, then there are even fewer relevant transactions. That compares with total sales volume by licensed dealers, which is upwards of 20 million per year." For example, Syed Rizwan Farook – one of the shooters in San Bernardino – relied on a friend to get several of the rifles and pistols he used because Farook doubted that he could pass a background check. That a friend and neighbor was the source is quite typical, despite the unique circumstances otherwise." "Also important are "street" sources, such as gang members and drug dealers, which may also entail a prior relationship. Thus, social networks play an important role in facilitating transactions, and an individual (such as a gang member) who tends to hang out with people who have guns will find it relatively easy to obtain one. Needless to say, that effort is not cheap or easy and requires that both the police and the courts have the necessary authority and give this sort of gun enforcement high priority." "Effective policing of the underground gun market could help to separate guns from everyday violent crime. Currently it is rare for those who provide guns to offenders to face any legal consequences, and changing that situation will require additional resources to penetrate the social networks of gun offenders." I agree with most of your quotes, the above is especially true. Pretty much it negates everything in the O.P. "The average age of guns taken from Chicago gangs is over 11 years." that was interesting, something I didn't know. So many responses here I don't know where to begin haha. Been a little bit busy of late but I will respond shortly. Thanks. Across the country there are roughly 900,000 Police Officers who while performing their duties, get to deal with the criminals, and offenders, who are illegally in possession of an illegal gun, and have used their guns to commit non race on race, and race on race, crimes with? So there are more guns in the U.S., than there are U.S. citizens? Its not the 2nd Amendment that is abused; it is the United State set in the Articles of State Constitution in relationship to a declaration of independence it creates on a Nations Constitution. Yes, it can be said the 2nd Amendment is why there are 393 million guns however it’s not a whole truth. Is it? The world population is placed at 7.7 Billion and this is much more likely the reason why the United state of addressing the burden of lethal force is at 393 million. As a Nation. No just a crime problem, it does appear as though the crime issue has a peak at the act of murder. Which is a death sentence applied without separation made with use of basic principle and legal precedent. You are entitled to your individual opinion. 2. Now in most states you have to have a safety license to own a gun which means you have to take a course on how to use it safely. This is actually very good news and something I was not aware of as not being a citizen of the US, and so I don't follow the US as much as that of my own nation. There are indeed reasons as to why police officers shoot. Not all of those reason though are justifiable. The uniform and title of "Police Officer" does not equate to "infallible human being." We’ve already got a lot of those in place. Could you elaborate? Would you please mind being more specific and telling me exactly what and how it has been put in place? Thanks. I think, I understand, your individual philosophy towards some of the 900,000 Police Officers in the United States, who do their best to protect the citizens of this country from the gun violence brutalities, that the criminals, and the offenders commit against their innocent victims, on a daily basis across the country? When the non race of race murders happened, were those murders justifiable, from your individual, and philosophical estimation? When the race on race murders happened, were those murders justifiable, from your individual, and philosophical estimation? A criminal, or an offender, with an illegal gun, does that, or does that, not make that criminal, or the offender, an infallible human? 393 million guns in the U.S., 325 million U.S. citizens, (and thousands are shot, maimed, crippled, or killed) by a criminal, or an offender, or a first time offender, with both illegally obtained guns, and legally obtained guns, and those 900,000 Police Officers, get to deal with that nonsense, whenever a crime has occurred? We're the one country, that has more guns than any other country? It's a sadistic shame, that some humans, seem to have more respect for a gun, than they seem to have for themselves, or for the other humans around them? "There are indeed reasons as to why police officers shoot. Not all of those reason though are justifiable. The uniform and title of "Police Officer" does not equate to "infallible human being." The fact of crime is not the basic principle held in united state for Constitutional reason of common defense of gun ownership. As we know constitution is a description of legal precedent and basic principle united together. Can you please identify your basic principle and legal reason either placed in court or not placed in judgment of court as legal precedent. Are we talking crime as legal precedent in united state? Are we addressing burden of lethal force? Are we talking about the power to set others to carry the burdens for us? I would like to point out a law is not a common defense such as fire-extinguishers, speeding tickets, seat belts. Law is a statement of truth, that can be brought to addressed in question to whole truth, to locate and separate nothing but truth. As a lawyer is licensed to built justice from this assembly. I say often say fabricate from a manufacturing past but that can be taken out of context to easy. There are many tragedies that have been caused by people that have picked up a gun either legally or illegally. There have also been many criminal tragidies that have been committed without the use of a firearm. That is not what i want to debate. I think the best debate has to do with how to improve background checks for legal purchases. 1. We should have a nationwide data base that is checked by each dealer before the purchase of each weapon. This data base should be use finger print technology and run against all law enforcement data bases. 2. Mental health doctors should have to report anyone they believe to be a danger to others to local law enforcement . Law enforcement should then fingerprint these people and add them to the data base as to disallow them from buying a gun. A person should also have the right to challenge this dtermination and have it decided in court. 3. The departments of motor vehicles data bases should be utilized to verify a persons identity. This would make it vertually improbable that anyone would be able to either use a fake I.D. or someone elses. I am a supporter of the right to bear arms but while these steps may make some gun enthusiests unhappy i don't believe that any restriction will make them happy. A lot of people will think that this would give the government a way to collect information on who owns what guns giving them the tools to later take their fire arms from them. So i propose that with the emplmentation of these rules that the government is restricted from collecting information pretaining to these purchases. On the other hand law enforcement should be informed when someone who should not be purchasing a gun attempts to. These rules are something might not like but most could live with. Who taught, or instructed you, in how to philosophically view things, in the apparent ways, that you individually do? AKA create a federal database of law abiding gun owners and their guns. That hasn't done a thing to reduce crime in the states that have adopted such policies. The fact is that there is crime surrounding both handguns and high powered guns and there does need to be something done to reduce the number of casualties that occur from gun-related crime each year. Indeed, it is a fact that there is crime surrounding both handguns and high-powered guns. But that something needs to be done to reduce the number of casualties is not a fact, but a subjective opinion. Premise: “The fact is that there is crime surrounding both handguns and high-powered guns” (Objective premise). Conclusion: Therefore, something needs to be done to reduce the number of causalities and/or deaths that occur from gun-related crime (Subjective Response. Nonetheless, this is not an argument about an argument. And the that because one thinks any part of the argument is subjective or otherwise is not strong enough to support the conclusion that the issue should be side-lined. In fact, gun related crime that results in either severe causalities or deaths accounts for higher rates than many other things within the US that gets more attention. During the September 11 attacks of 2001, 2,996 people were killed and more than 6,000 others injured. However, more vigilant measures were put in place to make sure this never happened again, and rightly so. Since then thousands of acts of terrorism have been thwarted. In comparison, on average approximately (rounded to the nearest thousand) 40, 000 firearm related death occur every year within the US. This is more than some cancers among many other things. The idea that because almost half of 100, 000 deaths every year is a small number in comparison to the US population which is more than 300 million is not a good enough premise to support the conclusion that nothing needs to be done whatsoever. By your own logic we might as well not do anything about terrorism or all those other things that currently get more attention. This makes it possible for terrorist to by and sell explosive devices; not a doo idea by any means. There is a very good reason as to why there must be law and order, and that applies to every nation. This is something that I wholeheartedly agree with. Note: One other thing I forgot to mention was the noticing of red flags and looking out for potentially serious mental health issues among some individuals. Also, another thing that I think one needs to take into account is education and/or bullying related issues. As already has been pointed out the notion that almost half of 100, 000 deaths every year in relation to the gun crime is a small number in comparison the US population that is more than 300, 000 000 is not a good enough reason to no attention whatsoever. I'd also really like to see these findings on how casualties have decreased as since to my own findings and that of many others it's been on the incline within the last 5 to 10 years. I'd also like to know what specific workings your referring to? Thanks. In an ideal perfect world yes. However, we don't live in an ideal perfect world, and nor can we expect the general populous to take the law into their own hands. Furthermore, as some people have said in the past in response to the gun argument is that evil will always find a way; and this is true. However, guns and especially high power fire armory has the capacity to bring about far more catastrophic harm than any other thing that a civilian could use to bring about harm to someone's, whether that be knives, poison, etc. As a result of regulations and the abolishment of assault weapons, casualties and deaths will be significantly reduced, regardless if some people will still get guns illegally anyway; it's a lot harder to acquire guns that are illegal than that are freely and easily accessible. Hi, and thanks for your response. gun safety should be taught in schools, there's absolutely no reason not to, there's more to safety other than handling and shooting firearms, knowledge is power. This is a very good point and I agree with this. Can you please elaborate as to why you think this is absurd and how you are so convinced that everyone else thinks this is beyond absurd? Or is this just the way feel in response to what you read; if it is the latter then that is your opinion and that's fine. Once again thanks for your response and at least one good point you did make. If government tyranny is your concern then you better start campaigning to acquire the exact amount of firepower as that of the US military because that is what you are going to need in the event of this highly improbable event. As I said, the numbers haven't been published for 2018, but the preliminary data shows a 6.7% drop in murders. Could you please tell me what kind of philosophy you think I have towards these police officers and that way I might be able to give you a far more accurate response as opposed to just assuming what you might be implying? And you have a pro gun mentality? Just like some of the criminals, and the offenders, have a pro crime mentality? You love your guns, just like criminals apparently love committing their crimes, with their illegal guns? It's quite the lose, lose, situation, isn't it CYDdharta? A common defense for the general welfare also covers burdens of civil matters not just criminal matters. This is a truth correct. "Put in place a stricter selection process for all Police Officers. As we have seen in past times there are Police Officers that are trigger-happy and tend to rely more on their guns than their actual brains. These courses of action would entail psychological tests, including intelligence testing." '"As we have seen in the past times, there are Police Officers that are trigger-happy and tend to rely more on their guns than their actual brains." You are aware that the non race on race, individuals, shoot and kill each other more, right? Sounds like some trigger-happy nonsense to me, wouldn't you think? And you, are aware, that the race on race individuals, shoot and kill each other more as well right? Sounds like more trigger-happy nonsense, as well, wouldn't you think, in that above instance, as well? "Could you please tell me what kind of philosophy you think I have towards these police officers and that way I might be able to give you a far more accurate response as opposed to just assuming what you might be implying?" Go preach your nonsense, to another. I'm not playing your preaching game. "You should take your own advice"
Can't handle the below realities? I know your not playing a game. Your intentionally avoiding a decision to create an atmosphere of whole truth. "I know your not playing a game. 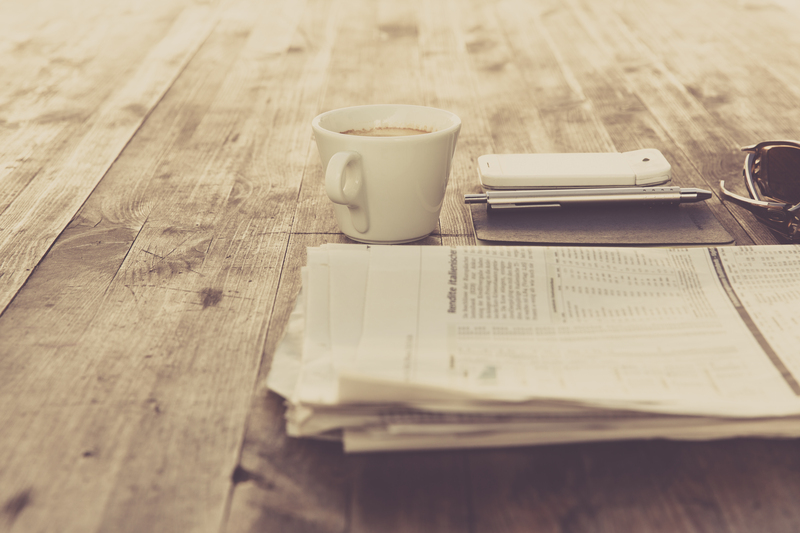 Your intentionally avoiding a decision to create an atmosphere of whole truth." Adding to the discussion, with more truth. "Guns kill more US children than cancer"
In 2016, vehicle crashes were the leading cause of death for children between 1 and 19 years of age. The next-most frequent: guns. One in three US homes with children under 18 had a firearm in the house, and 43% of those homes reported that the gun was kept unlocked and loaded, according to the report. In 2016, children in the US were 36 times more likely to be killed by a gun than the overall rate for children of 12 of the other wealthiest countries in the world, the researchers found. 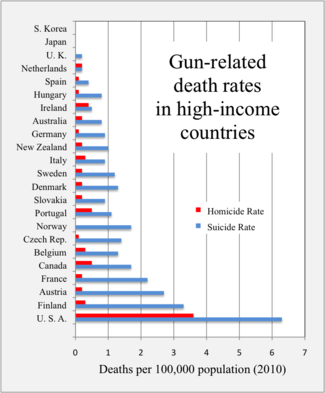 The US rate also eclipses that of low-to-middle-income countries; there were five times as many childhood gun deaths in the US than the overall rate in the seven low-to-middle-income countries that had 2016 data available." "The researchers used data from a US Centers for Disease Control database that compiles death certificates throughout the US; 2016 is the most recent year for which complete data is available. Of the 3,143 US childhood gun deaths that year, 1,865, or about 60%, were homicides. Another 35% (1,102 deaths) were suicides, and 4% (126 deaths) were unintentional shootings. The circumstances surrounding the remaining 1% (50 deaths) were too unclear to be categorized in this way. “Children in America are dying or being killed at rates that are shameful,” Edward W. Campion, the executive editor of the New England Journal of Medicine and a physician, wrote in an editorial that was published the same day as the study. 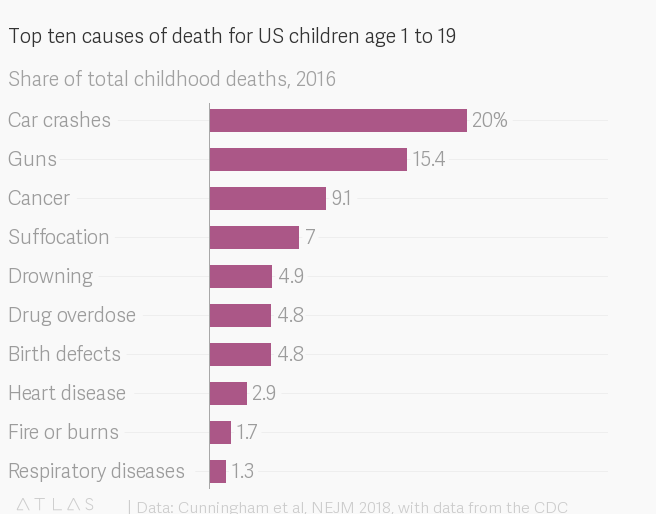 “The sad fact is that a child or adolescent in the United States is 57% more likely to die by the age of 19 years than those in other wealthy nations. 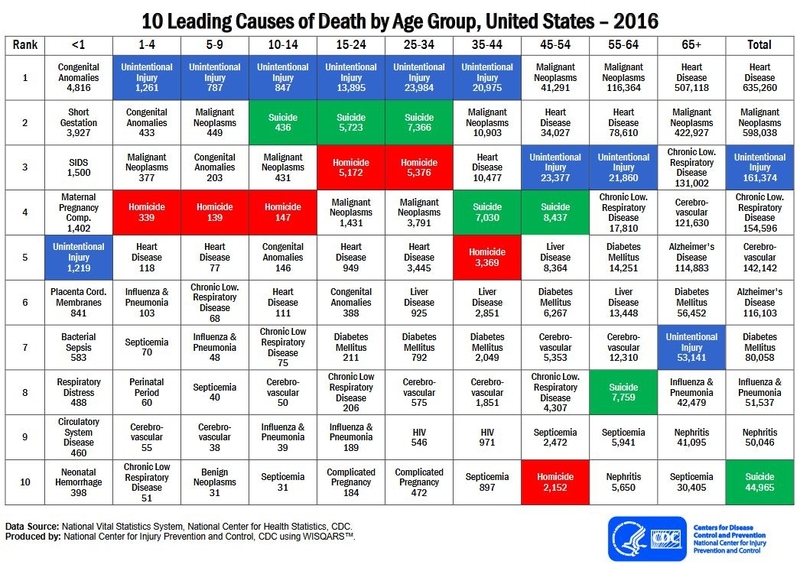 America’s children and adolescents are at far higher risk for death than are youth in other developed countries such as England, Sweden, and Australia." And ballistic shield is a common defense that should have been put in use. I think the real issue in our disagreement is that a message of readiness an opportunity for self-preservation is a hard thing to translate sometimes. This is kind of an awkward situation as education itself is supposedly undertaken for this purpose. And we are a Nation who has had children shield others from harm at great self-sacrifice to themselves. The burden from use of lethal force is a liberty TDKB. I am not your enemy truth is often just very bitter. I am sorry. The reason they chose to go all the way up to age 19 is so that they could include a much higher number of suicides and victims and perpetrators of gang violence. If they'd have used the dictionary definition of "child" which goes to around age 10 or 11, then homicides drop to 4th rank at 625. I do not feel TKDB is making statements or providing information that is not relevant. It is very relevant. If truth, why would adding an age group as a representation make any difference in a process to establishing the whole truth. We are not staging a public trial we are holding a public test to hold political office in basic principle. What happens during this test in relationship to suicides becomes a separation between self-inflicted suicides, and imposed suicide by using others to kill ones-self dramatically changing our search for all truth to base action. We are forming a state of union between basic principle and legal precedent this is the focus of our test. This can set the place of means where our debate might loses its idea of connection between basic principle guiding the legal precedent. We are now trying to remove guns from the public to prevent a form of imposed suicide which is really the danger left ungoverned even with gun removal or education. The reason for this is the issue is never addressed it is overlooked. So next the question may be how many times has it been overlooked? Is its legal precedent the truth it has not been addressed? Be glad, that none of the parents who have lost a child to a mass shooters gun violence brutality, since the mass shootings incidences began, hasn't made the decision to run for POTUS, yet right? Because, if that were to happen, guess who might be verbally up in arms over that parents choice to run for POTUS, in the only country in the world, that has the 2nd Amendment? Maybe the NRA, maybe CYDdharta, amongst other's right? Because if one of those parents decided to run for POTUS, I believe that he or she would get very far into an election. And maybe address, the 2nd Amendment, dutifully from their points of view? Instead, of seeing it from the way that some of the gun owning, law abiding citizens eyes see's it only? And listen to them espouse about this or that set of statistics, that they'll use to defend their gun ownership, along with using the 2nd Amendment, towards their self benefit, as well? Isn't how some of the lawful gun owners may express themselves, by using their own self exercised style of pro gun politics, to defend their guns, while the criminals, and the offenders, have created victims, with some of the same guns, that the lawful gun owners, maybe own? Because the gun has turned into the other doubled edged sword. My guess, is that many have been watching the news, to listen to what candidate, might say something, about the 2nd Amendment, or gun control, or hoping that another "first time offender," of criminal, or offender, doesn't go about committing another mass shooting gun brutality crime, while the 2020 Election cycle, is getting ready to start up right? Maybe some of those parents, have quietly considered running to become the POTUS, but have hesitated for this or that reason? Social media in general, has in a sense, become another form of a public trial? Some debate website forums, has in a sense, become another form of a public trial as well? CNN, and Fox news, both I believe have used tweets from Twitter, to express points of views from various individuals, who have expressed individual points of view over some topics? "We are not staging a public trial we are holding a public test to hold political office in basic principle." Have you read some of the things that some have expressed on Twitter, or some of the commentary, on YouTube, because of this or that video, because some aren't shy about exercising curse words to enhance an individuals points of view, over this or that topic? So, my guess, is yes, some of the social media, along with some of the other internet websites, have been used by some, as a public courtroom, because they've come to treat it as such? Now, these figures come to even more if you take into account all gun-related incidents including deaths and casualties. Also, I might have been mistaken to say that there was an increase in the last 5 or10 years; it was probably more accurate to say the last 2 or 3 years. In 2016 alone there were more than 14,000 homicides including mass shootings. https://www.bbc.co.uk/news/world-us-canada-41488081. Furthermore, Mass shooting have actually increased since 1999. What's more, is that homicide rates are actually lower in States with stricter gun laws. Anyway, let's just accept and contemplate on the information that you have provided for a moment. Excluding the freak peak incidencts of 1994 and 1995 the average number of homicides every year comes to (rounded to the nearest thousand) about 9.5 thousand. According to your own information all that we see is that there were two freak peak incidents in 1994 and 1995, and ever since then homicidal rates have been fluctuating with no significant incline or decline. Nontheless, these are still significant figures and like I said to someone else, by your own logic we might as well not have bothered to do anything about the terrorist attacks of September 11, 2001, because acts of terrorism are extremely rare; and many more times rarer than that of gun-related casualities or deaths/homicides caused by gun-related crime. I would also like to still like to see these working that you mentioned; not stats but these workings that you mentioned? I am not disputing that the majority of Officers do a great job in protecting the country. However, there are many times when Officers get things wrong and/or do things badly; and often times you will see or hear of an Officer standing before a Judge having to answer his/her actions and rightly so. These numbers are higher than what is stated in your reference. In 2016 alone there were more than 14,000 homicides including mass shootings. https://www.bbc.co.uk/news/world-us-canada-41488081. These numbers are also higher than what is stated in your reference. This is also not supported by facts. 12 of the 25 states with the lowest homicide rates also have the least restrictive gun laws. That peak wasn't 2 years, it was 9 years, from 1988 to 1997, which to me is more of a trend. And if we look at the per capita murder rate back to 1960, we can see that it was more like a 25 year trend. The key fact that you're ignoring is that guns are often used to thwart crime, up to 3+ million times per year; terrorism is not. @TKDB ; Come to think of it; by counting 19 year-olds as children, a number of "children" have been shot by our nation's enemies overseas in war zones after voluntarily enlisting in the Army and Marine Corps. You need to find better sources. "On 24 March 2018, more than two million people took to the streets in the US to protest gun violence. What the solution to that problem looks like depends on who you ask. Some wish to repeal citizens’ rights to bear arms, while others want to arm even more people. Most Americans have opinions that fall somewhere in between. But what would happen if that debate was suddenly and irrevocably put to rest – because there were no guns at all? What if all firearms in the world suddenly disappeared with no way to get them back? Guns obviously cannot just magically vanish. But this thought experiment allows us to remove politics from the equation and rationally consider what we could gain – and lose – should we ever actually decide to have fewer guns around." What type of gun violence brutality might you be protesting, via your individual philosophy? "I am not disputing that the majority of Officers do a great job in protecting the country. However, there are many times when Officers get things wrong and/or do things badly; and often times you will see or hear of an Officer standing before a Judge having to answer his/her actions and rightly so." Some of the police officers, who had interactions with a career criminal, offender, or maybe a first time offender, who had a gun, or didn't have a gun, but the career criminal, or offender, or first time offender, didn't comply with the police officers instructions, and the use of a gun, was used during some of the interactions, between some of the police officers, and the career criminals, offenders, or first time offenders? Wouldn't that be like borderline stereotyping, the police officers, overall because of what some individual police officers, did, during some of their interactions with the criminals, offenders, or the first time offenders? Do you know what types of gun violence brutality, that I have yet to see "Protested?" The non race on race gun violence brutality, where a non race on race individual, killed another non race individual? Or the race on race gun violence brutality, where someone of the same race killed, another individual of the same race? I wonder why those types of murders aren't protested over, like some of the police officer involved shootings have been protested over? Where is the overall, equality and fairness at?